The Subaru BRZ has had an interesting life over the past five years, enjoying several different iterations, a variety of aftermarket treatments, and even a few Hollywood cameos. Now, the BRZ is getting reinvented once again with the launch of the new tS, a performance-oriented version of the <sports coupe> boasting an array of nips and tucks to the exterior and interior, plus numerous enhanced suspension components. 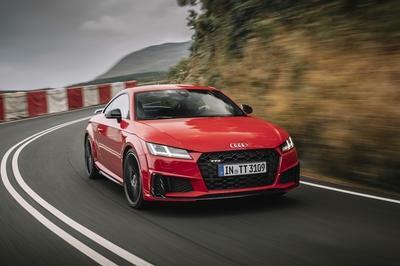 The result is even more performance potential from a two-door aimed squarely at the enthusiast audience, with a laser-like focus on maximum smiles in the corners. If the BRZ tS nameplate sounds familiar, it’s because Subaru offered it back in 2014 as a JDM exclusive model. Only 750 units were produced, 500 of which came in “standard” tS form, with the other 250 outfitted with the tS GT-Package. The tS is created in part by the automaker’s in-house performance division, Subaru Tecnica International, Inc., better known as STI, hence the name “tS” (“tuned by STI”). While that all sounds pretty good, it’s clear the tS isn’t a full-blown STI model. Instead, it’s got sharper handling chops and a few aesthetic enhancements, with no clear indication of gains made under the hood. And in the U.S., 200 horses can be a tough sell. Nevertheless, does the tS have what it takes to entice stateside buyers? Continue reading to learn more about the 2018 Subaru BRZ tS. The biggest change can be found in back, where the tS is rocking an exclusive STI wing made from carbon fiber. All told, the BRZ tS doesn’t look totally different from the standard model, with the proportions, stance, and lines all more or less the same as before. Rather, Subaru decided to add a smattering of new components for stylistic aggression and extra downforce. 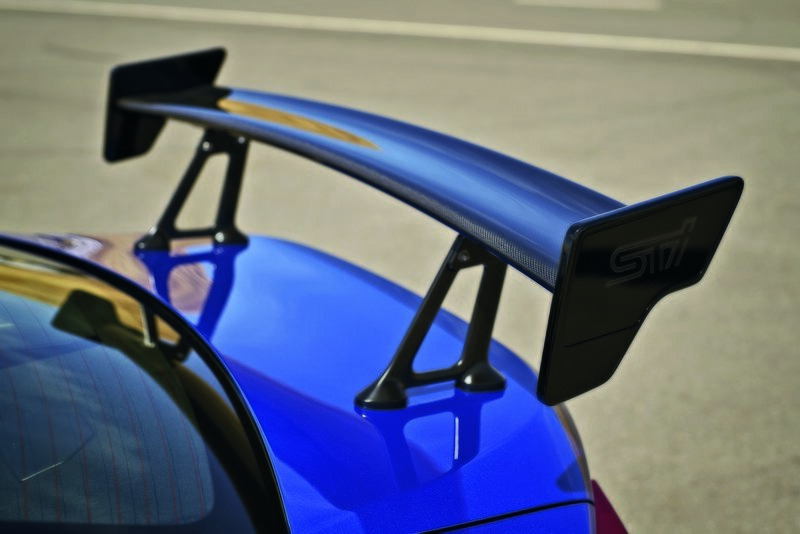 The biggest change can be found in back, where the tS is rocking an exclusive STI wing made from carbon fiber. This unit bears its black weave with gusto, announcing the car’s performance intentions with GT-like style and presence. This mammoth unit spans the entirety of the rear end, and will surely get you noticed on the street. And thanks to the manually adjustable set-up and variable angle of attack, it’ll keep the tail glued to the pavement just the way you want it. Further aero upgrades include underspoilers added to the front, side, and rear of the car, which Subaru says “helps control airflow for better traction and stability.” The tS also adds new 18-inch wheels with lightweight construction in the corners, marking the first time the BRZ has received 18-inch wheels from the factory. While added performance is expected for a model like the tS, so is a little extra styling flair. As such, a black finish was applied to the side-view mirrors and the shark fin antenna, as well as the BRZ and Subaru badges. In front, the bumper gets fog light deletes with STI-branded covers, while the requisite tS badging was applied in the obvious spots. Exclusive Cherry Blossom Red accents were also added to the front grille and rear bumper cover. Finally, buyers can get their tS in three different colors, including Crystal Black Silica, Crystal White Pearl, and Subaru’s famous WR (World Rally) Blue Pearl. 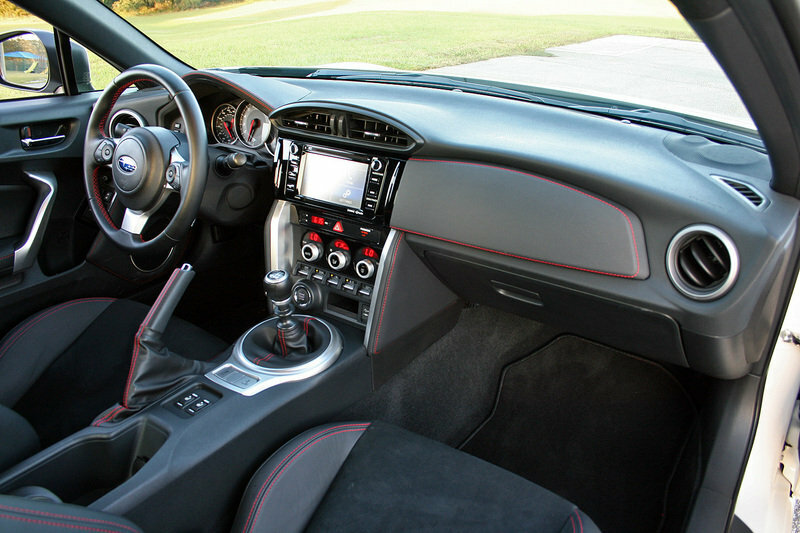 Interior from standard BRZ shown. The tS’ cabin provides that feeling of ‘specialness’ thanks to black leather and Alcantara upholstery, as well as red contrast stitching and accents. From the perspective of performance, this section is definitely the least impactful. That said, it’s still vital for buyers to feel that special edition gloss while sitting in the cockpit, so the tS obliges with black leather and Alcantara upholstery, as well as red contrast stitching and accents. The treatment is extended to a variety of locations, including the steering wheel, door panels, dash, knee pads, shifter, and handbrake, while the seat’s side bolsters are covered in red leather. And all that means you won’t be forgetting you’re sitting in a limited-run tS model any time soon, but just in case you still blank on the name, Subaru embroidered the tS logo right into the seatbacks. Further upgrades include a unique gauge hood, while the center console is finished in a cast black finish. The tS also get red seatbelts in front, plus a frameless interior rear view mirror. As is, the BRZ’s cabin is a tight, yet supportive place to sit, and the tS’ various upgrades seem to complement that approach nicely. 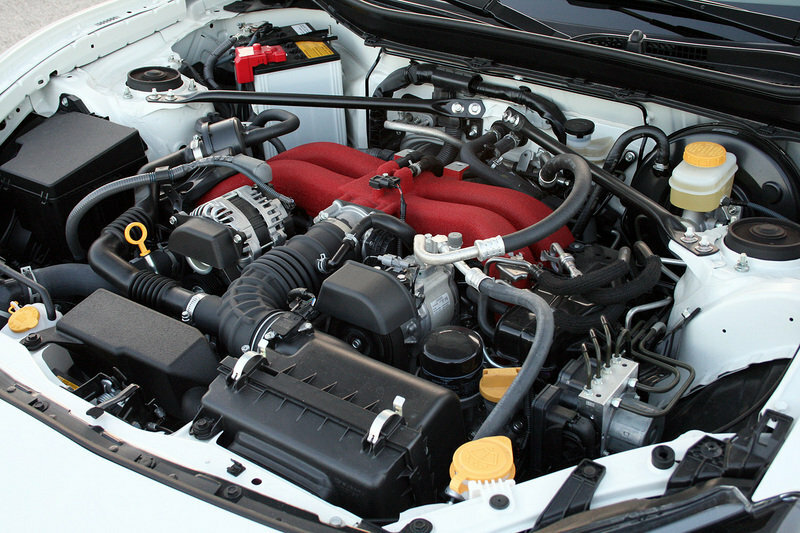 Engine from standard BRZ shown. 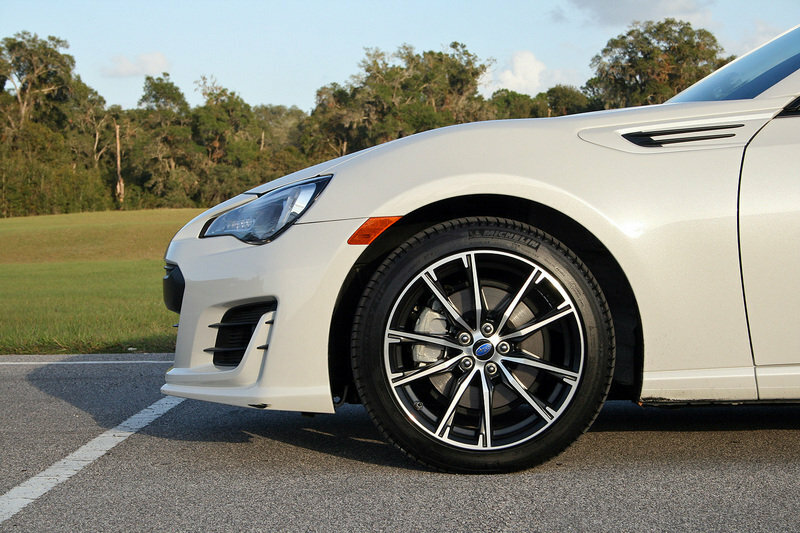 The tS has to make do with the stock BRZ’s 205 horsepower and 156-pound-feet of torque. 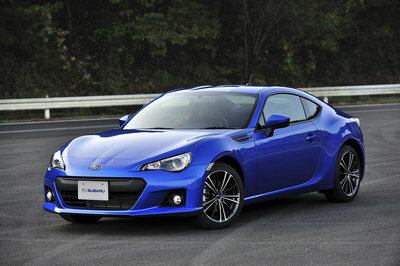 Here’s a shocker – the Subaru BRZ tS doesn’t come with any upgrades to its 2.0-liter four-cylinder boxer engine. Of course, considering the model’s history, the addition of something like a turbocharger would probably shatter the world view of enthusiasts all over the globe, so good on Subaru for keeping our expectations in line. Sarcasm aside, the tS has to make do with the stock BRZ’s 205 horsepower and 156-pound-feet of torque. 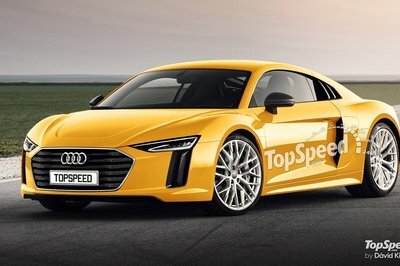 That means the 0-to-60 mph time should go unchanged at around 6.2 seconds, although a tenth or two could be found thanks to the upgraded rubber (more on that in the next section). Okay, so it’s no more powerful than any other BRZ we’ve seen before. That doesn’t mean the tS isn’t gonna be faster around a track. Quite to contrary – the whole point of a model like this is elevating the stocker’s handling and cornering abilities, and considering the intuitive, utterly tossable nature of the base BRZ, the tS should be a real hoot at the edge of adhesion. To this end, the tS adds upgrades like new STI-spec dampers and springs from Sachs in all four corners. Under the hood, you’ll find a flexible V-brace, while draw stiffeners for the chassis and sub-frame help to sharpen the steering even further. 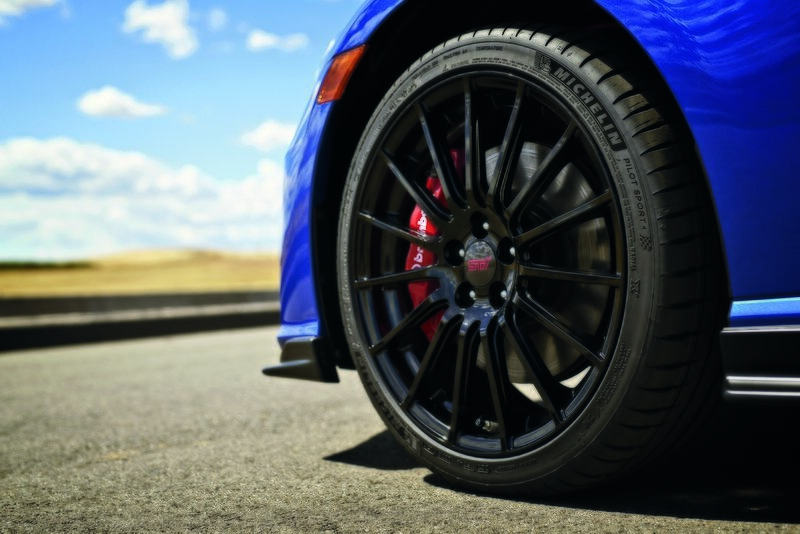 Stopping power is enhanced thanks to upgraded Brembo brakes, added front and back with bright red calipers. Finally, the tires are Michelin’s Pilot Sport 4 rubber, measured at 215/40R18. It’s a nice bit of kit, and considering STI’s history, it should do well in blessing the BRZ with ever-greater thrills behind the wheel. That said, it would’ve been nice if Subaru provided us with some exact numbers in terms of performance gains, like lateral grip, lap time improvements, slalom speed, or hell, even stopping distance. I guess we’ll just have to wait for the inevitable real world comparison test for all that. Ah yes, the pricing. The ultimate deciding factor for any vehicular purchase. Subaru has yet to provide an exact figure for the U.S.-bound BRZ tS, but did say production will be limited to around 500 units, and that dealers will be receiving the first batch some time in the first quarter of next year. Of course, we can always speculate, and if we were to guess, we’d place the BRZ tS in the $35,000 to $40,000 range. Any more than that, and it becomes difficult to justify a pruchase, even with the tS’ “limited edition” status. While the might offer a targa top bodystyle versus the BRZ’s hardtop coupe, these two machines are most definitely competitors. 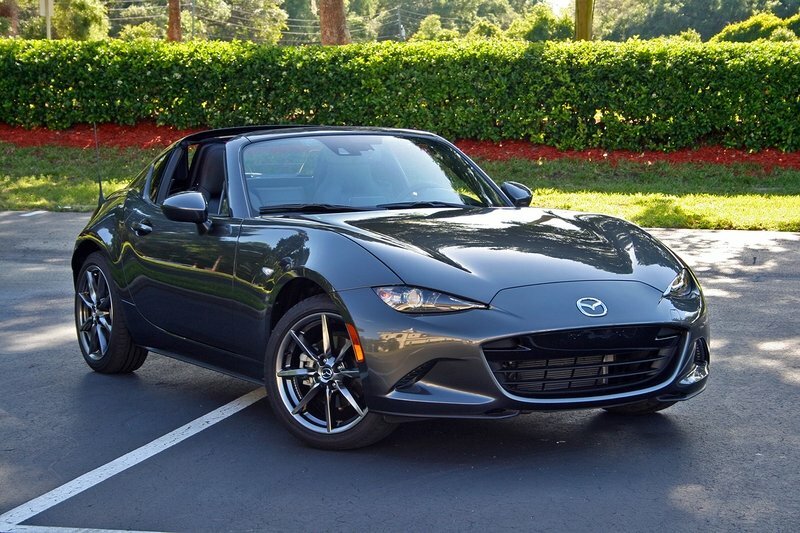 The Miata falls short of its rival in terms of power, with just 155 horses and 148 pound-feet of torque at the rear axle, but it makes up the difference with a lighter chassis and more nimble handling. 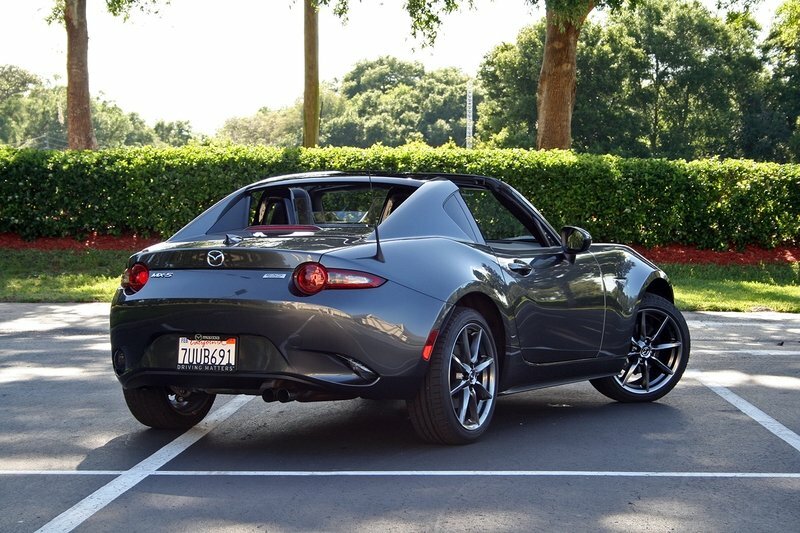 Plus, the RF just looks awesome in its targa configuration. 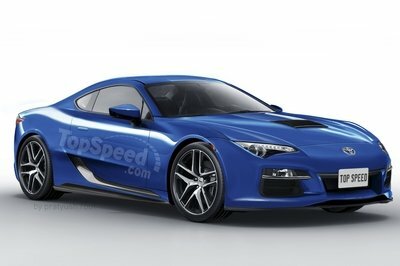 Furthermore, the BRZ is in desperate need of a next-gen model, making the RF the fresher choice of the two. Read our full driven review here. Looking for more power? Get a Camaro. Just don’t be surprised when this 200-horse giant slayer fills your rearview. As expected, Subaru says the 2018 BRZ tS “delivers the highest level of ‘fun to drive’ and ‘pure handling delight’ through greater flexibility, better control and stability.” Of course, all that cornering goodness doesn’t include anything new under the hood, and critics are sure to list the unmodified engine as a major grievance, especially at the price range we’re speculating. 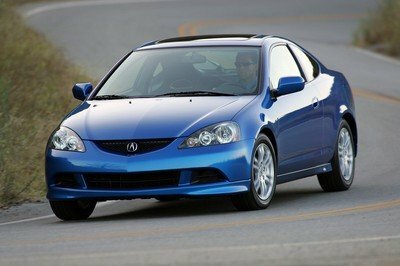 But in the end, the tS isn’t made for those people drooling for tire-shredding output and blistering 0-to-60 mph times. The only time this thing should ever get anywhere near a drag strip is if it’s on the way to an autocross or road course event. 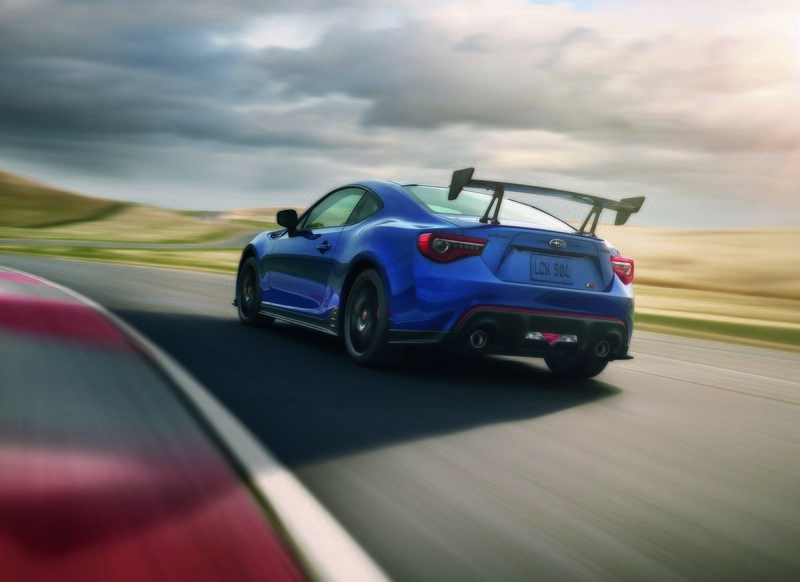 The BRZ tS is all about keeping the momentum, rather than making it, thus elevating what was already there without changing the original formula.